So as you all know, my costume for Blizzcon is the first one exploring the realm of armor. I really wanted to bring some polish to the costume and ensure it was stable, and wearable for the long-term. I did a lot of research about various ways to craft armor, which I'll go over below, before I settled on thermoplastics. Craftfoam - The most inexpensive option. You can easily warm up foam, and bend it to the desired shape, let it cool, and it will (usually) hold its form quite well. That being said, craftform easily breaks/bends/tears and displays damage quite readily. It can also be difficult to paint! So, you have to layer it with lots of glue, and fabric, to give the foam more strength. Leather - This material is great if you have the tools and experience to use it. The leather itself can be quite expensive, but it often produces some of the highest quality and best looking results in the armor category. This might be the most difficult one to start off with, so becoming familiar with the other tools, patterning, and general construction process is recommended before jumping into this. Thermoplastic - One of the biggest downsides of using this option is how easily the cost adds up. Depending on the amount of armor you need to do, this might be a really great route to go. 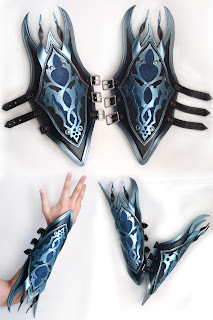 Wonderflex and Worbla are the two main contenders in this category, and they are great for large and small designs. They can be warmed easily to mold/shape (even into small pieces, like clay! ), and then cool and harden into something solid/hard, like plastic. 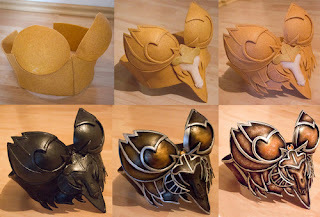 Kamui Cosplay makes some of the best Worbla/Wonderflex tutorials, try starting here. Choosing the option that works for you is crucial to creating successful armor. If you don't have the materials to work with leather or the thermoplastics, don't sweat it! The craft foam armor looks great, too. One of the other biggest factors to consider is: time. What do you have time to complete? Another option is to combine all of the options above! For my Enchantress costume, I am using a combination of both Wonderflex and Worbla (since there are differences between even those two). As a general note: there are also additional options that aren't listed above. These are just the most common methods I've seen within the cosplay community and have dabbled in a bit myself. If you have any other suggestions, feel free to comment below! Thanks for reading, everyone! Leave any comments or questions below.